Our healthcare department specializes in representing healthcare practitioners in all aspects of their professional practice, from start-up to a sale and everything in between. We regularly assist our clients in day-to-day practice matters, including general practice and patient issues, vendor relations, as well as serving as counsel for positive expansion projects or dispute/litigation counsel. We are prepared to address any of the common issues that effect clinicians in the rapidly evolving healthcare continuum, including practice start-up (PC/PLLC selection and formation, first lease, patient forms, compliance, on-boarding and employee policies, financing documents), buy/sells, employment and independent contractor arrangements and department of labor audits, employment/partnership and buy-out contracts, Office of Professional Medical Conduct matters, patient issues, compliance (kickback, HIPAA and OSHA), management and vendor arrangements, leases, real estate purchases and litigation. K&K also assists Physical Therapists, Physician Assistants, Registered Nurses and Nurse Practitioners in all areas of practice. 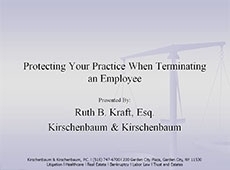 Jennifer Kirschenbaum is the managing partner of Kirschenbaum & Kirschenbaum, P.C. 's healthcare department. Jennifer devotes her practice towards assisting practitioners in all aspects of private practice, Office-Based Surgery practice, Article 28 facility formation and operation, Independent Practice Association formation and operation, as well as hospital based practice and hospital relationships/arrangements. Do I need to do an Exit interview? How do I get my In Network Participation status? Does forming a corporate entity protect me from malpractice claims? Looking to Buy, Sell, Hire? This area is reserved for healthcare classifieds, practice announcements, solicitations, offers, etc. Those wishing to hire; ook for employees or locum tenens; mergers or practice affiliations; sell or buy; equipment sale or exchange; practice vendors; insurance brokers; business brokers; insurance companies. There is no charge to post a listing here*. Be sure you include along with the content of your listing, your correct and complete contact information. If you would like to submit a posting, please send an email to jennifer@kirschenbaumesq.com.